I hope this newsletter finds you well. This week has been filled with putting out fires for funding, field, elections and admin - so pretty much embers were flying from every corner here so I want to thank our hardworking staff for doing their best each day to support the Neighborhood Councils. It's not easy to keep up with the amazing work of 95 Neighborhood Councils around the City so we're very thankful for the help we get from our great Board of Neighborhood Commission and our super City Attorneys. Speaking of our City Attorneys, we are partnering with them to do a training tomorrow in the Valley that will satisfy board member ethics requirement as well as funding training. You will need both trainings in order to vote on funding items. You can find the details on our EmpowerLA Events Calendar. I submitted our budget request to the Budget & Finance Committee this week. Our proposal is to use unspent Department and Neighborhood Council funds to provide funding for staffing and resources to maintain and improve our policy, outreach and technology, including preparations for a citywide online Neighborhood Council election voting platform for 2016. Please weigh in on the budget, not just ours, but on all the City budget. As you know, Neighborhood Councils can weigh in officially on Council Files via Community Impact Statements. All of these documents are tracked via the City Clerk's Council File Management System. If you are an active user of the system, please take a moment to provide the City Clerk feedback on your experience in their survey. I had a few breaks this week where I got to celebrate. The first was to stop by Neighborhood Council Valley Village to happily swear in their new board, led by their awesome President, Tony Braswell. 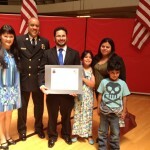 The second was to celebrate our own Armando Ruiz's graduation from LA Fire Department's Leadership Academy. By the end of the year, our entire management team will have gone through this fantastic program, which teaches how to lead collaboratively. A huge thanks to the LAFD for providing this program for free! If your Neighborhood Council has some funds left over this fiscal year, please consider contributing to your Congress of Neighborhoods and Neighborhood Council Budget Advocates. For more information on how to do this, click here. I'm off to Region 8 elections tomorrow in East Los Angeles. If I don't see you tomorrow, have a relaxing weekend! What is City Council Up To? Hack for LA Registration Now Open! GovJam is Coming to Los Angeles! Help the League of Women Voters Help You: Take a Survey!